Three short years after a full redesign, the Nissan Altima gets an extensive mid-cycle refresh for the 2016-MY. Despite enjoying a decade of steady sales increases, nobody would blame the OEM for refusing to stand pat in a category that includes such mid-size kingfish as the Toyota Camry, Honda Accord, and recently redesigned Hyundai Sonata and Mazda6. The list of changes includes new front and rear fascia, the introduction of sporty SR editions, and a suite of advanced safety features. The base 2.5-liter inline four, 3.5-liter V-6, and “D-step” continuously variable transmission return for another tour, albeit with slight gains in fuel economy. Specs for 2016 Nissan Altima. The 2016 Altima is available in S, SR, SV, and SL trims; the V-6 is limited to SR and SL editions. The new car swaps a sleek, sophisticated exterior for the “energetic flow” design language that has been turning heads — for better or worse — on the mid-size Maxima and Murano crossover. The SR amplifies the effect with a small rear spoiler, sporty wheels and a stiffer suspension on the outside as well as paddle shifters and a leather-wrapped steering wheel and gearshift in the cockpit. Smoother underbody coverings, active grille shutters, and more aerodynamic sheet metal combine to reduce drag and improve highway fuel economy by a single mile per gallon (mpg). The four-banger still produces 182 horsepower (hp) and 180 pound-feet (lb.-ft.) of torque but now delivers 39 mpg in highway driving, leading the class and knocking on the door of some gas-electric hybrids. The 3.5-liter V-6 delivers 270 hp, 251 lb.-ft., and 32 mpg on the highway. A suite of available safety equipment includes forward-collision, blind-spot and rear-cross-traffic warnings, autonomous emergency braking, and adaptive cruise control; the full package is available only on SL editions. Base models come equipped with 16-inch wheels, keyless entry and ignition, and power locks, windows and mirrors. “S” editions add a rearview camera, six-speaker audio with a 5-inch touchscreen display, and automatic headlights. Upgrading to SR, SV, and SL trims brings a 7-inch touchscreen as well as accoutrements such as 17- or 18-inch wheels, leather, power seats, remote engine start, a bigger, badder sound system, and satellite radio. 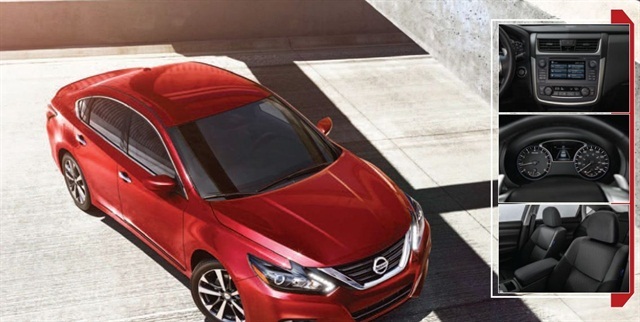 The 2016 Nissan Altima is available now. Prices start at $22,500 for a base 2.5 and top out just north of $32,000 for the lineup-leading 3.5 SL.